When it comes to the top names of Super Late Model racing on dirt, many fans think of Scott Bloomquist, Jonathan Davenport, Brandon Sheppard, Don O’Neal, Steve Francis, Jimmy Owens, Jason Feger, Shannon Babb, and of course, Bobby Pierce. 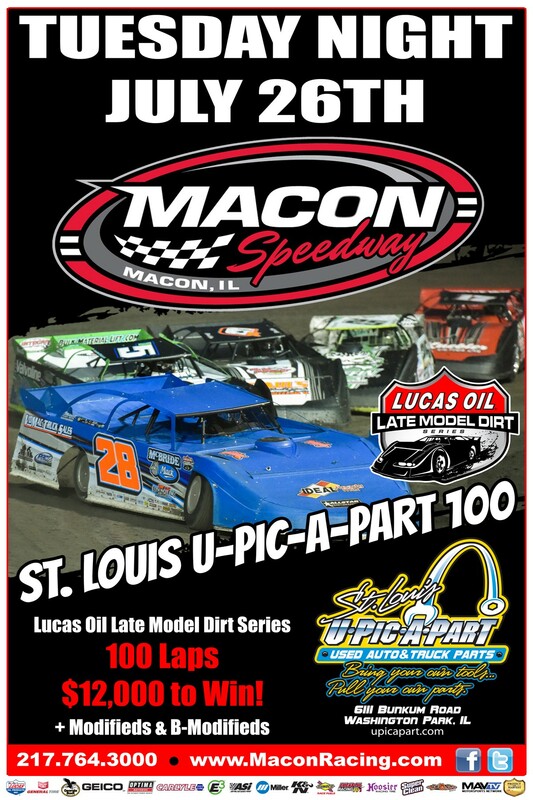 It doesn’t end there, and it won’t end this Tuesday night at Macon IL Speedway where all of the top names converge to battle for a $12,000 top prize in the St. Louis U-Pic-A-Part 100 in the Lucas Oil Late Model Dirt Series. The wanted man will likely be Oakwood, IL star Bobby Pierce. Pierce had another unbelievable Summer Nationals, winning 10 out of the 22 events and claiming the championship in convincing fashion. One of those wins took place at Mighty Macon Speedway in the Herald & Review 100. Pierce was dominant on that night, cruising to victory as much as one can cruise at a venue as wild as the 1/5-mile speedplant. The young wheelman also led a major portion of the Lucas Oil event last year before a flat hurt his chances. His biggest challenger may be one of the most famous racers in the history of dirt tracks, Scott Bloomquist. While the veteran driver doesn’t have the best record at Macon Speedway, this year could be a little different as he has been on a roll in 2016. In addition to leading the standings by 280 over Jonathan Davenport, Bloomquist has won nine events on the ’16 tour, including five of the last eight. He’s looking for his third championship with the tour but his first since winning back-to-back in 2009-2010. While we are at it, let’s talk a bit about Jason Feger. Always a threat no matter where he runs, Feger made a visit this past weekend to dial in his #25 and claim the top prize in the Kerbystrong 100 at Macon. Feger looked dominant for a while before speedway regular, Guy Taylor, stepped it up a notch and raced by. Not to be denied, Feger found a little more to reclaim the lead late in the race to go on to an exciting victory. Interesting to see whether Feger will use any knowledge gained from Saturday to pick up speed and consistency on Tuesday night. While it’s hard to pinpoint who fans can expect to see at the front of the field when the checkered waves on lap 100, we all know that guys like Jonathan Davenport, Brandon Sheppard, Don O’Neal, Steve Francis, Jimmy Owens, and of course, the Mowequa Missile, Shannon Babb will be contenders. Owens claimed the win last year and was followed by Feger, Devin Moran, Babb, and Ryan Unzicker. Pierce was leading the event before suffering a flat tire on lap 58. In addition to the Super Late Model class, the Billingsley Towing UMP Modifieds and UMP B-Mods will be in action, coming off of good events this past weekend. The B-Mod bounty is up to $100 if someone can beat Tim Hancock in the B-Mod division. Hancock, who is 9 for 9 this year, must finish the race for the bounty to be claimed. Tuesday, July 26 pit gates will open at 3:00, grandstands at 4:00, Mod and B-Mod pill draw will end at 5:50, hotlaps will begin at 6:00, and racing will take the green at 7:00. Tickets will be available at the gates for a price of $30 for adults and $5 for kids 11 and under.